Asa Khalif of Black Lives Matter Pennsylvania is arrested at the Center City office of state Attorney General Josh Shapiro on Monday, November 13, 2017. Those were the some of the choice words that Black Lives Matter Pennsylvania activist Asa Khalif bellowed inside state Attorney General Josh Shapiro’s Philadelphia office on Monday in the moments before a two-man protest turned into one man's arrest. Back in August, the AG’s office announced it would investigate the case of David Jones, who was fatally shot by Philadelphia police Officer Ryan Pownall on June 8. The shooting came after Jones was stopped for illegally driving his dirt bike “in a reckless manner” near Whitaker and Hunting Park avenues. 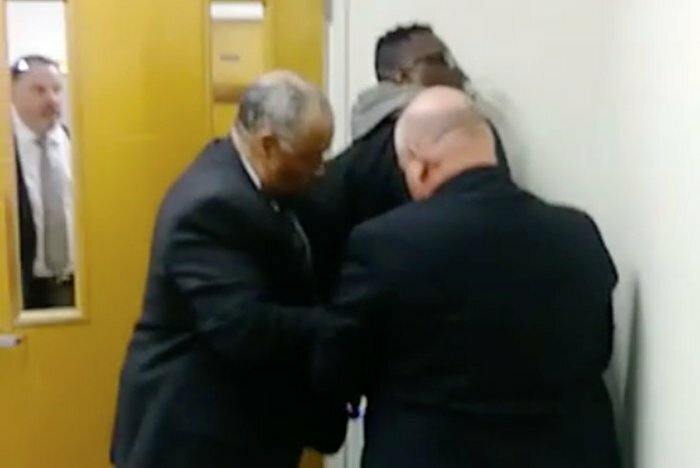 As Raw livestreamed the protest on Facebook, he captured a confrontation that saw Khalif get arrested after he allegedly pushed out a door window during the tense exchange. Be warned: the full video – which you can see below – contains a lot of profanity. After his 1 p.m. arrest, Khalif spent roughly 16 hours in custody. He was charged with misdemeanors including terroristic threats, harassment, defiant trespass, disorderly conduct (noise) and instigating vandalism. After being released from custody early Tuesday morning, Khalif spoke to PhillyVoice about the arrest, his time in custody and the underlying issues that led to both. He prefaced the conversation by noting that it wasn’t supposed to go down the way it did. “I swear to God this was not planned. I was planning to go to the Meek Mill (protests) but it didn’t pan out that way,” he said. “But, we have to keep pressure on the attorney general in this case. In this case, Khalif maintained, the whispers hold that investigators have completed their probe and will announce the findings when people are distracted by the holidays and not paying close attention to the news. Grace confirmed that the Jones case remains under investigation after a “conflict referral” from the city District Attorney’s Office. He said no announcements will be made until the investigation has concluded. Since Shapiro was in Harrisburg on Monday, Grace said Khalif was advised he needed to schedule an appointment. “He refused to do so. Mr. Khalif then cursed repeatedly and pushed out a window panel of a security card access door. Philadelphia police subsequently took Mr. Khalif into custody,” he said. “The Attorney General strongly supports and protects the right to protest. Khalif said he was taken away in a paddy wagon that stopped at a couple of “undisclosed locations that I couldn’t identify” before arriving at the Ninth District in Fairmount where he’d remain until 5 a.m. Tuesday. “You never get used to being arrested,” said Khalif, who couldn’t venture a guess as to the number of his past arrests. “You could clearly feel the hostility. You could cut it with a knife. Somebody said something that wasn’t cool and I responded with something that wasn’t cool either. But, we called a truce. He noted that a few people from the Meek Mill protest outside the Criminal Justice Center came over to the Ninth to make sure police knew that they knew he was there. He said the video clearly captured the fact that “I was not resisting arrest” and contested the window-related charges on the ground that it was a shoddily installed pane of glass that fell out during the conflict. “The bottom line is this: I was incarcerated for a period of time that was longer than the (officer) who shot and killed someone. They are arresting protesters for holding politicians to a standard of transparency that they promised they would abide by,” Khalif said. “A murderer gets to go home for dinner and the protester gets a cheese sandwich in jail.